Teddy Pendergrass started singing gospel music in Philadelphia churches, becoming an ordained minister at ten years old. While attending public school, he sang in the citywide McIntyre Elementary School Choir and in the All-City Stetson Junior High School Choir. A self-taught drummer, Pendergrass had a teen pop vocal group when he was 15. By his late teens, Pendergrass was a drummer for local vocal group the Cadillacs. In the late '60s, the Cadillacs merged with another more-established group, Harold Melvin & the Blue Notes. 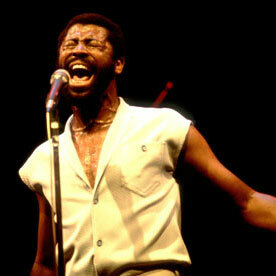 In 1970, Harold Melvin, now aware of Pendergrass' vocal prowess, asked him to take the lead singer spot. It's no secret that Kenneth Gamble and Leon Huff wanted Marvin Junior of the Dells for their Philadelphia International Records roster. Since the Dells were signed to Chess, they were unavailable. When the gruff'n'ready vocals of Pendergrass came their way, they eagerly signed the group. Beginning with "I Miss You," a steady stream of hit singles flowed from the collaboration of Pendergrass and Gamble & Huff: "If You Don't Know Me By Now," "The Love I Lost," "Bad Luck," "Wake Up Everybody" (number one R&B for two weeks in 1976), and two gold albums, To Be True and Wake Up Everybody. A 1982 car accident left Pendergrass paralyzed from the waist down and wheelchair bound. After almost a year of physical therapy and counseling, Pendergrass returned to the recording scene, signing a contract with Elektra/Asylum in 1983. His ninth solo album, his Elektra/Asylum debut, Love Language went gold the spring of 1984. Philadelphia International issued two albums of unreleased tracks, This One's for You (1982) and Heaven Only Knows (1983). Other albums included Workin' It Back (1985), Joy (1988, whose title track went to number one R&B for two weeks), and Little More Magic (1993). The latter half of '90s found Pendergrass recording for the Surefire/Wind Up label, and in 2002 he released a holiday album, This Christmas I�d Rather Have Love on BMG Special. Truly Blessed (the name of a 1991 Elektra album) is the title of the autobiography Pendergrass co-authored with Patricia Romanowski.